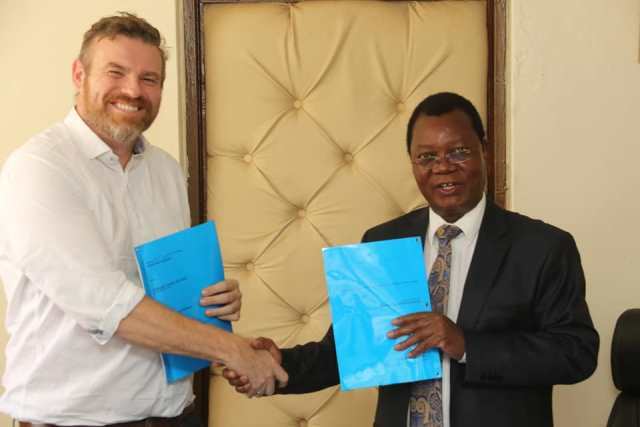 The County Government of Kakamega has signed a collaboration agreement with Vestergaard to provide farmers with better and improved bags for storage of their agricultural produce (grains). The bags are insecticide treated with a hermetic liner that protects grains and seeds against internal and external insect attacks. In the MoU signed by H.E. the Deputy Governor Prof. Philip Museve Kutima for the county government and Mr. Allan Mortensen Vestergaard’s Director of Food security , the county government of Kakamega will among other things support implementation of the project’s pilot study in Matungu and Malava sub counties and coordinate with relevant departments in the Ministry of Agriculture, Livestock production, Fisheries development and Cooperatives to effectively implement the project. The DG said the county government will effectively execute its part of the deal to improve the county’s food security. He termed the MoU as timely owing to immense investments by Governor Oparanya’s government in the agricultural sector across the county. The pilot study is also expected to set up cost efficient, risk free and safe storage facilities (warehouses) and to create a business opportunity for rural/community based entrepreneurs to benefit small scale farmers. Other benefits to farmers include better earnings from sale of the crop to the investor. In attendance were Chief Officers Dr. Kelly Nelima and Mr. Jeremiah Namunyu, County Attorney Moses Sande, County Director of Agriculture Johnstone Imbira and Vestegaard’s area manager for Food Security James Mwangi among others.